A tasting of recent releases of wines from Master Sommelier Greg Harrington’s Gramercy Cellars has confirmed what many have long suspected. Harrington’s syrahs complete the Washington triumvirate of syrah-focused producers who have elevated the grape to new heights domestically. These syrahs are way beyond good. They are groundbreaking, distinctive, at times unfathomable (in the sense of being too deep to reach the bottom). Along with Cayuse and K Vintners, Gramercy’s lineup of expressive, highly intellectual syrahs is sure to challenge even the pickiest of consumers. They will test your palate, intrigue your mind, and bring as yet unknown rewards if cellared. Harrington’s first vintage was 2005, which means that the 2009s just released are the culmination of just his opening half decade. Yet what progress has been made. Three years ago, while researching the second edition of my book, I was impressed enough to make Gramercy a four star winery – the highest I could give it with such a short track record. Today it easily joins the top, five star rank, and were I to do another book (God forbid!) it might have to be given six. Though sommeliers-turned-winemakers are not uncommon in California, Greg Harrington is the first in Washington to turn from one extremely successful career to another. He passed his master somm exam at 26, working with chefs Joyce Goldstein, Emeril Lagasse and Wolfgang Puck before deciding to plunge into winemaking. Inspired by the potential he saw in Washington wines, he and his wife Pam wasted no time. Shortly after discussing the possibility of making wines “some day,” Harrington was in Walla Walla arranging to make wines in a rented facility; he brought in his first grapes in 2005. The couple left their east coast home in 2006, set up housekeeping in both Seattle and Walla Walla, and launched a winery partnership with Jamie Brown (Waters). The Waters/Gramercy winery opened in time for the 2007 crush. 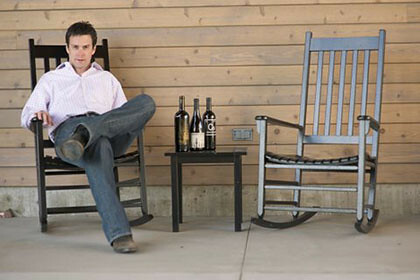 In 2008 Harrington was named “Best New Washington Winemaker” and Gramercy “Best New Winery” by a Seattle magazine. That year he and Brown also launched their Wines of Substance brand, along with a super-deluxe red wine called 21 Grams. In 2009, in his spare time, Harrington climbed Mount Rainier. The man is driven, no doubt, but he has as sharply-defined and specifically-focused a winemaking vision as anyone in Washington. Believing that great wines share common traits – great vineyards, minimalist winemaking, time and patience – Harrington selects fruit from Les Collines, Pepper Bridge, and Forgotten Hills in Walla Walla, Portteus and Minick in the Yakima Valley, and Phinny Hill in Horse Heaven Hills. He harvests ripe but not over-ripened grapes, intervenes minimally in the winemaking, and does not smother the wine in new oak. “Too many wines have excessive alcohol and new oak, are overly fruity, and taste like they could be from anywhere,” he writes on Gramercy’s website. More true today than ever. Harrington’s unobtrusive tasting room – the old Amavi spot just up the road from Canoe Ridge – is open on weekends and by appointment. The Tasting Notes card on display reads “If you found us, it’s free (the tasting).” There is a waitlisted Masters Tasting Association also. Members receive two wine shipments annually, averaging $45/bottle – a steal given the quality; and have access to limited reserves and special events. See the Gramercy website for details. The club wines are labeled with a red stripe, and include such things as an Olsen vineyard grenache, a Walla Walla cabernet, and a Minick vineyard syrah. Though Harrington’s Bordeaux blends and varietal wines are excellent, it is his syrahs that ascend to the highest level. Sadly, most of the ‘09s are already sold out. Nonetheless, a visit to the website (or tasting room) may turn up something of note, such as the exceptional 2009 Minick syrah. The advice from here is, get on the waiting list now. From the report: "Syrah only sells in Northwest. Rhone demand still strong -- as long as it's not called Syrah"
"Washington makes great Syrah and Washingtonians know it. 30-40% of all Washington wine is sold to the Northwest. Washington, Oregon and Idaho are very conscious of Washington wines. They look at Washington Syrah as one of their home wines, one of the things they are known for. Washington seems to have escaped the pummeling that Syrah took with the Australian connection. But if you talk to the rest of the country, you can sell Syrah but only if you call it a Rhone blend. They'll drink Rhone, but they won't drink Syrah." Ed, In Memphis we love Syrah, and as Paul failed to mention "stems rule".